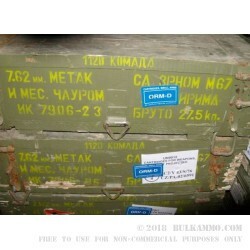 This wooden crate of 1,120 7.62x39mm cartridges is surplus from the former nation of Yugoslavia’s military. We can’t speak to just how old this ammunition is, but that Yugoslavia was disintegrated in 1992 ought to give you a jumping off point. Still, the non-existent country’s non-existent military has little use for it anymore, so you’re getting a phenomenal deal on it. The Cyrillic stenciled wooden crate alone makes it well worth the price -- especially if you need a prop for the James Bond movie you’re filming in your backyard. These cartridges are fitted ten apiece on stripper clips, so you can enjoy fast reloads without fumbling around with individual rounds. Their 123 grain bullets sport full metal jackets, so they will preserve your bore against rapid fouling as you enjoy more accurate shots in between cleanings. 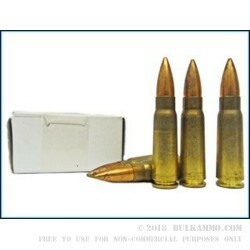 Their casings are made from brass, although their Berdan primers would make handloading them a rather complicated task. Please note that this ammunition is corrosive, and thus more appropriate for your next trip to the range as opposed to prepping. Cheap, but clean your rifle quick!